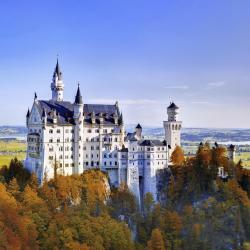 Looking for hotels near Neuschwanstein Castle? Located just 0.9 mi from the Neuschwanstein and the Hohenschwangau Castle, Hofwiese provides self-catering accommodations in the town of Hohenschwangau. Landhaus Nina has accommodations with barbecue facilities and free WiFi, and is located in Schwangau. Located within an 11-minute walk of Neuschwanstein Castle and 1.9 miles of Tegelbergbahn in Schwangau, Landhaus Hohenschwangau provides accommodations with free WiFi. This 4-star hotel is set directly beneath Neuschwanstein Castle, only 1.9 mi from Füssen. The spa area includes a Finnish sauna, steam bath, relaxation room and a hot tub with views of the castle. This hotel is located between Neuschwanstein Castle and Hohenschwangau Castle on the Romantic Road, 2.5 mi from Füssen. Hotel Müller offers elegant rooms and a Bavarian-style restaurant. This historic hotel is just a 2 minute walk from Schloss Neuschwanstein castle. It offers spacious rooms, great views of the Alps, and Bavarian food. This accommodations features a minimalistic style with organic materials and is located in the heart of the Garmisch district, just 2625 feet from the Classic ski area. If you love Nordic-style design and architecture (which we do) Quartier is heaven. Set in Saulgrub in the Bavaria Region, 11 mi from Garmisch-Partenkirchen, Altenauer Dorfwirt features a sun terrace and views of the mountain. Guests can enjoy the on-site restaurant. The owners were more than accommodating and made us feel like part of the family. Set amid the wonderful Alpine landscapes of Garmisch-Partenkirchen, this traditional 4-star hotel offers elegant rooms and excellent spa facilities, just 8.1 mi from the Austrian border. The hotel was very comfortable and warm with free parking underground. This 4-star hotel features Alpine-style rooms, suites and studios with free internet access and a spa with swimming pools. It is located in the Bavarian winter sports resort of Garmisch-Partenkirchen.... The food, staff, location, dog friendly, kid friendly, modern hotel. This hotel is located on a hillside with a breathtaking view all the way from the Upper Bavarian to the Allgäu Alps, and features a wellness area with pool. View and location are exceptional. Enjoying scenic views of the Allgäu Alps, this nonsmoking hotel in the Bavarian health resort of Hopfen am See features spa facilities and a spacious garden with panoramic terrace. Had a great stay here. Great location, lovely room, nice staff and had a farm-to-table breakfast. This privately owned Alpine-style design hotel is located in the center of Oberammergau, 2297 feet from the Passion Theater. Hotel Maximilian offers design rooms and a spa area. All is good .. the front desk .. the restaurant.. the bar ..
Hotels with great access to Neuschwanstein Castle! Located in the center of Lermoos, the Postschlössl is just 328 feet from the Zugspitz Arena Ski Area. The hotel was really family-friendly. The swimming-pool was great and the SPA area too. Dorfhof enjoys a quiet location in Breitenwang. It offers an apartment with panoramic mountain views and a flat-screen satellite TV. The apartment was spotless, modern and comfortable. Located in Eisenberg, Hotel Christine features a restaurant, bar and free WiFi. Guests can enjoy the on-site restaurant. Free private parking is available on site. Rooms include a flat-screen TV. This family-run hotel offers free WiFi in all areas and rooms with balconies overlooking the Allgäu Alps. We liked everything about Hotel Christine! Hotel Tannenhof is nestled at the foot of stunning hills in Lechaschau, and yet is just a short walk from the center of Reutte. A rich and healthy breakfast is available every morning. The hotel is charming, super clean, eco friendly, and serves great breakfast. Time to go macro. Along a sandy slope, Bunatan Point’s soft coral garden is a favorite hangout for dozens of tiny sea critters – which makes it a haven for underwater photographers, too. If you want to join the chase gear up with your goggles and camera to see how many creatures you can photograph. Reserve tickets online at least two days in advance OR get there at opening. After picking up tickets, go directly up to the castle and explore the outer grounds up there. You can take pics and shop in the town below after the tour. You CANNOT be late for the tour (and it is a hike)!! Get to the ticket office when it opens. Get to the ticket office when it opens. Timed tours in different languages throughout day. Leave Plenty of time to get to castles either by bus , carriage ( both at extra cost) or by foot ( up the side of a mountain!) if you miss your time, you are out of luck. Absolutely amazing architecture and views. Absolutely amazing architecture and views. YOU WILL WALK SO MUCH. Wear comfortable shoes. We had a 1 1-2 year old and 3 year old with us, and there are so many stairs we carried them up and down—no strollers in the castles—but it was worth it. Loved our whole day up at the castles! Loved our whole day up at the castles! Be aware when booking your trip that Schwangau is not where you want to stay-it’s much too far to walk anywhere(we tried) and the bus doesn’t go there. If you are going to see the castles, stay in Horn or Altenschorfer (the Hotel Waldmann is the BEST)!!! Go to Fussen and do a tour, getting tickets on your own and getting in was a NIGHTMARE! it would be a 5 minute bus ride and money well spent not standing in line for tickets and getting in the back door. They also give information about the castle. The only reason most people go to Schwangau. The only reason most people go to Schwangau. And, in spite of being unable to go in, the Marienbrucke being closed, and the hordes of tourists, it still was well worth the trip. Make sure to buy tickets for the castle way in advance, and be at the castle early (parking is quite difficult to find later in the day). People are talking about Neuschwanstein Castle! Explore guest hotel reviews featuring "Neuschwanstein Castle"
We were group of four (2 couples) and we had the whole lovely apartment with two rooms, kitchen and bathroom, all very nicely decorated, very warm and cozy, it really was to enjoy. There was also a cute backyard covered in snow, it looked amazing. The location is great if you have car as we did - parking right in front of the house, and short drive to either Fussen or Neuschwanstein Castle. Beds were so comfortable and bathroom was warm and spacious. Extremely great location 30 minutes leisurely walk along the countryside from Neuschwanstein castle, the bus stop right at the front of hotel, great view from hotel seeing Neuschwanstein castle stands in mountain and cloud. Great facilities -SPA, room smell natural fragrantly. So good expected breakfast. Staffs are friendly, very good English speaking and introducing Schwangau. It is worth a time to visit Schwangau and stay at Hotel Weinbauer. The backdrop of this hotel was a beautiful mountain and the neuschwanstein castle. Rustic and cottagey feel to the property. Yuki the resident Husky. But the real star of this property were the hosts. Especially Klaus. Warm and welcoming and very cheerful. They make you feel right at home. The breakfast is adequate and the food is fresh. Fresh local (King Ludwig) beer available through the day 😁. Very good location for local sightseeing. This cozy hotel is located just a 10 minute walk from the gates of Neuschwanstein Castle and about 1.6km from the center of Fussen. The breakfast spread in the morning (included in the rate) was incredible - the pastries, cheese, and meat were all incredibly fresh. There is also free parking with the hotel and the room had a skylight view of the mountains. If you are hoping to visit the castles, Kleiner Konig is an excellent choice! We stayed in the apartment on the top floor. It was very nice. It was nice to have a separate room, as one of my traveling companions snores at night. Wifi worked well. I didn't have any trouble getting the keys and checkout was easy. I even got a discount coupon to use at the Neuschwanstein castle. We also had a nice view of the castle from the room. I would stay here again. The hosts were wonderful! Thank you! We could see the Neuschwanstein Castle from the apartment window. Beds were comfortable, place was very clean and spacious. Furnished with everything from kitchen to bedroom. Apartment is within walking distance to ticket booth for the castles. Public transportation stop is within short walking distance to Landhaus Nina! Great location! Easy to walk through the town to the grocery and/or restaurants. Hotel had a view of Neuschwanstein Castle from their sun terrace. Although we visited during off season, we were offered a la carte breakfast along with friendly service. Rooms were spacious and exactly what we needed for our short stay. Great beds, perfect location. The house was clean and the owners were very friendly and hospitable. Very close to Neuschwanstein castle and beautiful hikes around. The house has a garden perfect for outside evenings. This was a wonderful ,comfortable and well equipped Apartment . It had pleasant views . Close to Neuschwanstein castle , but far enough off main road that you could not hear the traffic to the castle.